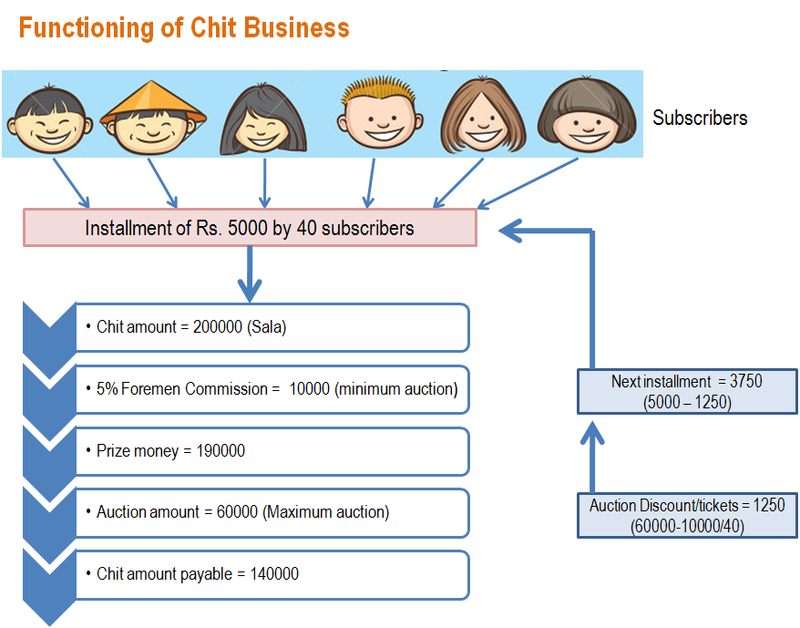 Different chit funds operate in different ways. The basic necessity of conducting a 'Chitty' is a group of needy people called subscribers. The foreman - the company or person conducting the chitty - brings these people together and conducts the chitty. Foreman is also the person responsible for collecting the money from subscribers, presiding the auctions and keeping records of subscribers. He is compensated a fixed amount (generally 5% of gross chitty amount) for his efforts; other than that the foreman does not have any specific privileges; he is just a subscriber of the chitty. Following is an example and general pattern of chit operation. E.g. : 5000 * 40 = 200,000/- Where 5000 is the maximum installment contribution needed from a subscriber/ticket, 40 is the duration of the chitty suppose in months and 200,000 is the chit amount/sala. The duration also equals the number of subscribers/ticket, as there must be (not more or less) one subscriber/ticket to receive the price money every month. The chitty starts on an announced date, every subscriber come together for the auction/lot. As per Kerala chit act, the maximum auction is limited to 30% of the sala, that is 60,000 (auction discount) in the above example. When there is more than one person willing to take part in maximum auction, a lot is conducted and the 'Lucky subscriber' gets the prize money for the month. If there is no person is willing to take the maximum auction, then an open auction is conducted and the person bidding highest discount get prize money. In both the cases the auction discount is equally distributed among subscribers or is deducted from their monthly installment. For example if the auction discount is settled on a sum of 60,000, then deducting the foremen commission, the balance auction discount is divided by 40 (the total number of subscribers/tickets) and everyone gets a discount of 1250/-. The same practice is repeated every month and every subscriber gets a chance of receiving some money.